When it comes to Casual Hat Style, Kangol Hats are King. Nothing finishes a Man's Style Like a black Kangol hat on his head. You won't be disappointed with one of these black Kangol hat called the 504 Ventair. The 504 Ventair is pretty self explanatory in that the vents located around the perimeter of the hat vent out the natural heat that your head produces. This black Kangol hat is all that and a bag of chips. Read more about Kangol Here. Take a look at all the styles and colors of Kangol Hats Here. Have you seen our Great Selection of Crocodile Shoes Here. Get luxurious Belvedere Shoes Here. Questions you may have about wearing kangol hats. Question: How do Kangol hats come sized? Answer: Kangol makes all of their hats and caps sized in Small,Medium,Large and Extra Large to make sizing and fit simple. Since Kangol hats are soft primarily, they have a little elastic in the hat bands and will mold them selves to you when you put them on making for a very comfortable fit that will look great on you the first time and every time you wear it. Kangol hats are so versatile and comfortable that you'll quickly forget you're even wearing one on the top of your head. Question: Should I wear the Kangol hat with the Kangaroo on the front or on the back? Answer: That all depends on who you are as a person and your sense of personal style when it comes to wearing hats. The more traditional man will wear the hat as it was originally designed with the kangaroo on the back of his head with the hat brim facing forward but if you are more of an edgier type of dresser, I'm pretty sure that you'll wear your Kangol hats with the kangaroo facing front the way you would see someone like Samuel L. Jackson wearing them who happens to be a really big fan of Kangol hats. Almost every time you see him somewhere or being interviewed you can bet your bottom dollar that he is wearing a kangol hat on his head with the kangaroo facing forward. Try it both ways and you'll figure out which way you will prefer wearing them. Question: Is there any particular style of clothing I need to wear with a Kangol hat? Answer: You can wear pretty much what you like to wear from button down shirts and jeans to mens casual dress clothes like 2 piece walking suits and linen outfits which all look good with Kangol hats. That is the beauty of Kangol hats because they are simply so versatile to wear which why they continue to be popular year after year. I even see men wearing Kangol hats with suits when they are outside in the cooler weather when they have their overcoats or trench coats on and still look very good wearing them. One thing for certain is that once you buy your self a Kangol you'll be chomping at the bit to wear it as much as you can. Men who are really into getting dressed up buy them in practically every color they can to match all of their outfits. Question: What does Ventair mean? 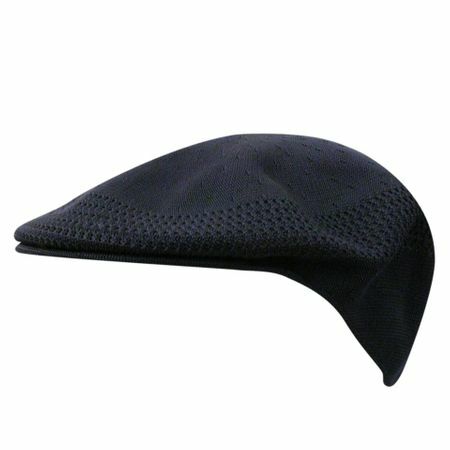 Answer: Kangol invented the Ventair fabric which is a type of woven Poly Acetate which is almost like a type of mesh that allows air into and out of your hat keeping your head cool and comfortable in warmer months unlike many other hats that don't properly breath and have your head sweating quickly. With a Kangol, that problem is greatly reduced and provides day long comfort.